Introduction: Our primary aim is to determine whether there are differences in the opinions of users of two distinct NOTES® simulators in aspects of performance, realism, utility and ease of use. 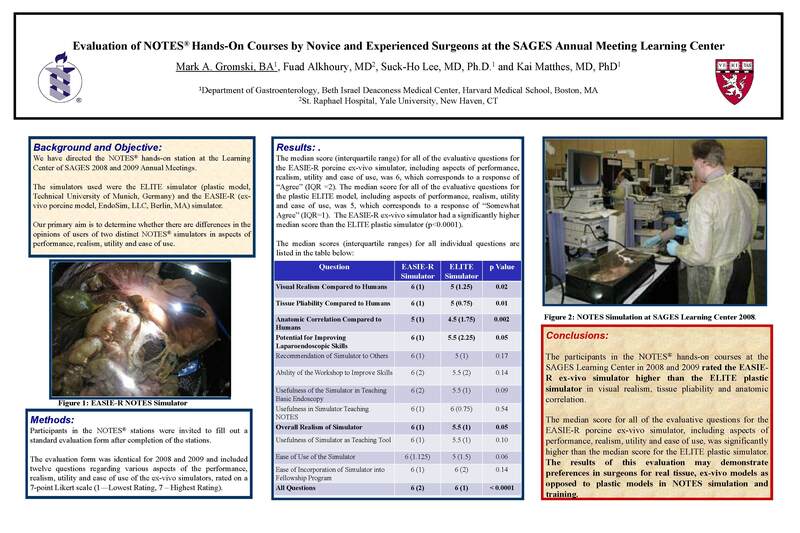 We have directed the NOTES® hands-on station at the Learning Center of SAGES 2008 and 2009 Annual Meetings. The simulators used were the ELITE simulator (plastic model, Technical University of Munich, Germany) and the EASIE-R (ex-vivo porcine model, EndoSim, LLC, Berlin, MA) simulator. Methods and Procedures: Participants in the NOTES® stations were invited to fill out a standard evaluation form after completion of the stations. The evaluation form was identical for 2008 and 2009 and included twelve questions regarding various aspects of the performance, realism, utility and ease of use of the ex-vivo simulators, rated on a 7-point Likert scale (1—Lowest Rating, 7 – Highest Rating). Results: The average score for all of the evaluative questions for the plastic ELITE model, including aspects of performance, realism, utility and ease of use, was 5.25 ± 1.04. The average score for all of the evaluative questions for the EASIE-R porcine ex-vivo simulator, including aspects of performance, realism, utility and ease of use, was 5.83 ± 1.03. The EASIE-R ex-vivo simulator had a significantly higher average score than the ELITE plastic simulator (p<0.0001). Specifically, in visual realism of the model compared to humans, the EASIE-R ex-vivo simulator had a significantly higher user rating than the ELITE plastic simulator, 5.91 ± 0.87 vs 5.00 ± 1.07, respectively (p = 0.02). In tissue pliability compared to humans, the EASIE-R ex-vivo simulator had a significantly higher user rating than the ELITE plastic simulator, 5.91 ± 0.91 vs 4.60 ± 1.02, respectively (p = 0.01). In anatomic correlation of the model compared to humans, the EASIE-R ex-vivo simulator had a significantly higher user rating than the ELITE plastic simulator, 5.68 ± 0.68 vs 4.40 ± 1.20, respectively (p = 0.003). There were no significant differences between the simulators in individual questions specific to user evaluation of utility of the simulator in improving laparoendoscopic skills, recommendation of the simulator to others, ability of the workshop to improve skills, usefulness of the simulator in teaching basic endoscopy, usefulness of the simulator in teaching NOTES®, overall realism of the simulator, usefulness of the simulator as a teaching tool, ease of use of the simulator and the ease of incorporation of the simulator into a fellowship program (P>0.05). Conclusions: The participants in the NOTES® hands-on courses rated the EASIE-R ex-vivo simulator higher than the ELITE plastic simulator in visual realism, tissue pliability and anatomic correlation. The average score for all of the evaluative questions for the EASIE-R porcine ex-vivo simulator, including aspects of performance, realism, utility and ease of use, was significantly higher than the average score for the ELITE plastic simulator. The results of this evaluation may demonstrate preferences in surgeons for real tissue, ex-vivo simulators, as opposed to plastic simulators in NOTES simulation and training.